https://archive.org/download/Longvipa/longvipa.mp3Knowing the Long-vowel sounds and Short-vowel sounds of English can help you be better at pronouncing new words and deciphering spelling patterns, but it also helps to be aware of the IPA (International Phonetic Alphabet) symbols for the vowels. Some people learn IPA symbols when they first begin to learn English, but others have never seen these symbols before. Either way, it can be useful to refer to them for some aspects of English pronunciation. One of the main differences between Long and Short-vowels is that Long-vowels have two parts to their sound and Short-vowels have one part. In the Long-vowel IPA symbols below you can see the two parts for each Long-vowel. Here are two situations where it is helpful to take a look at the IPA symbols of Long-vowels. In order to pronounce both of the vowels in a sequence clearly, so that they can both be heard clearly, we need to make special use of the second part of the first vowel. Let’s see how that works with the words “idea” and “fluid”. Idea — In this word the first vowel of the sequence is a Long-E, and the IPA symbol (/iy/) shows a “y” at the end. The trick is to use that “y” part to separate the two vowels. This is done by pronouncing it a little bit stronger than usual. This makes the word sound like it could be spelled as “ideya”. Fluid — In this word the first vowel is a Long-U. The IPA symbol (/uw/) shows a “w” at the end. This “w” is emphasized, to make a separation between the [u] and the [i], and it sounds like “fluwid”. This kind of consonant change can happen when the consonant is followed by a high-front vowel sound — this is seen as either a “y” or “i” in IPA symbols. In words like these, there is (or once was) either a Long-I-2 /iy/ or a Long-U-1 /yuw/ right after the morphing consonant. The consonant combines with the high-front part of the vowel sound and changes. In some of these words, the original vowel sound is lost. For example, in “social” the [i] is lost when it combines with the [c] (the [a] remains as schwa). However, in “educate” the [d] gets changed but the Long-U can still be heard. 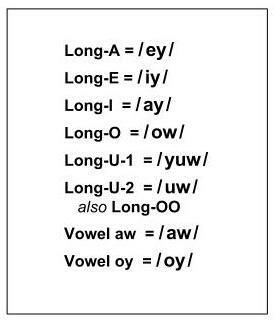 SO, overall, it is most helpful to know the vowel system in terms of Long and Short-vowels, because many pronunciation patterns make use of them, but also keep your eye on the IPA symbols for extra clues.